Men's Leather and Sterling Silver Wristband Bracelet, "Tribal Warrior"
Henry Anthony Sanny designs a bracelet of powerful masculine elegance. The bracelet is braided with quality black leather and closes with a sterling silver clasp with ornate tribal motifs. 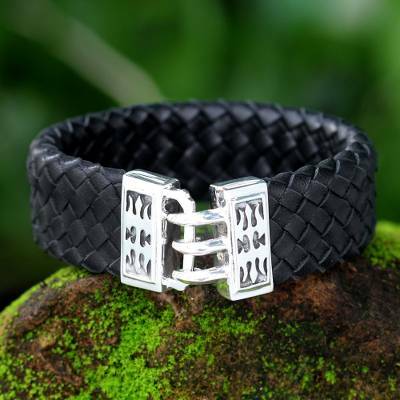 You can find men's leather braided bracelet 'Tribal Warrior' by Henry Anthony Sanny in jewelry categories such as No Stone Bracelets, Silver Bracelets, Sterling Silver Bracelets, Leather Bracelets, Braided Bracelets and Wristband Bracelets. Enjoy exploring these sections for other Novica treasures.